Cabra Cini has made quite a few appearances here and there, primarily in various anthologies. Being part of collections is great for a character, but sometimes that character wants a little more. Like starring in their own miniseries, which is where Cabra Cini finds herself in with Cabra Cini: Voodo Junkie Hitwoman - Dark New Year. It's written by Sam Johnson, illustrated by Bruno Letizia, Nathan Ramirez and R.D. Ricci, published by Actuality Press. Oh and it's free. No longer willing to let her boyfriend/pimp treat her like dirt, Cabra Cini got lethal payback with the help of voodoo magik - and liked it. Voodoo became her new addiction and Cabra has cleaned up her act and forged a deadly new vocation. "Voodoo Trespass," Cabra's debut story, throws us headlong into her twisted world, when she is hired by bereaved parents to take out the teenage boy who killed their daughter, playing vampire. Cabra utilizes her magik to access a dimension known as The Infinity, which, for those who trespass upon it, can serve as a dimensional gateway between where they are and wherever they want to go. Though with what The Rook, the ruler of The Infinity, throws at its abusers, the journey can come at a monstrously high cost. Cabra Cini: Voodoo Junkie Hitwoman heralds in a Dark New Year! 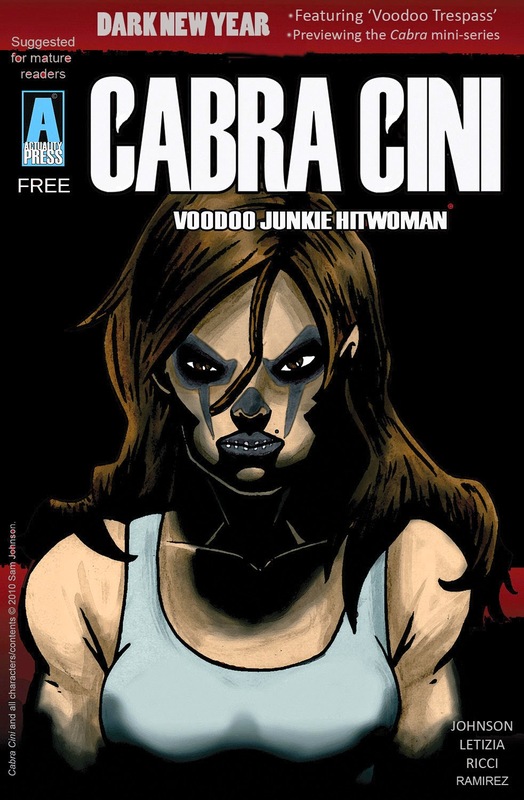 Following a number of anthology appearances, cult character Cabra Cini is graduating to her own mini-series, and this is previewed in Free Digital Comic Cabra Cini: Voodoo Junkie Hitwoman - Dark New Year; which also re-presents 'The Voodoo Lady's debut story. 'Voodoo Trespass', Cabra's debut story, throws us headlong into her twisted world, when she is hired by bereaved parents to take out the teenage boy who killed their daughter, ‘playing vampire’. Cabra utilizes her magik to access a dimension known as ‘The Infinity’– Limbo’s ‘crazy cousin, locked away in the attic’ – which, for those who trespass upon it, can serve as a dimensional gateway between where they are and wherever they want to go. Though with what The Rook, the ruler of The Infinity, throws at its abusers, the journey can come at a monstrously high cost. -Michael Wearden, Mike's Comic Blog. -Steven Leitman, Reading with a Flight Ring. “A hard hitting story with incredible artwork. I'm already a junkie and quite addicted to this character and can't wait for more.